Do I really need to put smoke detectors in every room in the house that I’m renting out? That question came to me yesterday. I said boy I don’t think so. But I’ll look into it. So I dug up my old real estate books. I didn’t find what I wanted there. I went back to good old Google. Not that Google is old. But it sure is useful. I found an article on landlord-tenant laws in Pennsylvania regarding smoke detectors. § 3800.130. Smoke detectors and fire alarms. (a) A facility shall have a minimum of one operable automatic smoke detector on each floor, including the basement and attic. (b) There shall be an operable automatic smoke detector located within 15 feet of each bedroom door. (c) The smoke detectors specified in subsections (a) and (b) shall be located in common areas or hallways. (d) Smoke detectors and fire alarms shall be of a type approved by the Department of Labor and Industry or listed by Underwriters Laboratories. (e) If the facility serves four or more children or if the facility has three or more stories including the basement and attic, there shall be at least one smoke detector on each floor interconnected and audible throughout the facility or an automatic fire alarm system that is audible throughout the facility. (f) If one or more children or staff persons are not able to hear the smoke detector or fire alarm system, all smoke detectors and fire alarms shall be equipped so that each person with a hearing impairment will be alerted in the event of a fire. (g) If a smoke detector or fire alarm becomes inoperative, repair shall be completed within 48 hours of the time the detector or alarm was found to be inoperative. (h) There shall be a written procedure for fire safety monitoring if the smoke detector or fire alarm becomes inoperative. So this is what Google told me. But what does that really mean? I don’t know. I found it on the Internet, that does not make it true. Well, it looked official. My stance is this: I make no representations that this statement is true and/or currently the law. If this is the law, then it looks as if we need to have at least one smoke detector on every floor. That’s a minimum. Plus, we also need to have a smoke detector within 15 feet of every bedroom door. So if you have a hallway and you put the smoke detector in there and all the bedroom doors are within 15 feet, I guess that’s sufficient for that floor. Now, I do say this, we are looking at the minimum requirements here. We look at the minimum to see what is required and not what we insist on doing, and no more. I hope not. I would rather see more than the minimum, and that your conscience is to provide safety for your tenant. So what do you need to clear your conscience? 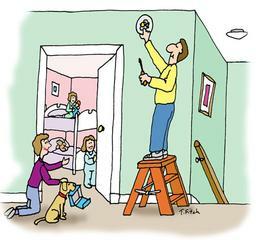 How many smoke detectors would you put in your own house? Consider these questions and those may be your answers. Why be a minimalist when it comes to life safety?